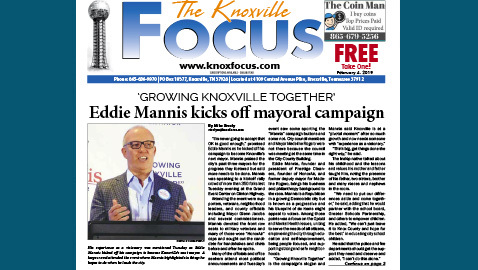 “I’m never going to accept that OK is good enough,” promised Eddie Mannis as he kicked off his campaign to become Knoxville’s next mayor. Mannis praised the city’s past three mayors for the progress they fostered but said more needs to be done. Mannis was speaking to a kickoff rally crowd of more than 350 folks last Tuesday evening at the Grand Event Center on Clinton Highway. Attending the event were supporters, veterans, neighborhood leaders, and county officials including Mayor Glenn Jacobs and several commissioners. Mannis devoted the front row seats to military veterans and many of those wore “HonorAir” caps and sought out the candidate for handshakes and chats before and after he spoke. Many of the officials and office seekers attend most political announcements and Tuesday’s event saw some sporting the “Mannis” campaign buttons and some not. City council members and Mayor Madeline Rogero were not there because the council was meeting at the same time in the City-County Building. Eddie Mannis, founder and president of Prestige Cleaners, founder of HonorAir, and former deputy mayor for Madeline Rogero, brings his business and philanthropy background to the race. Mannis is a Republican in a growing Democratic city but is known as a progressive and his blueprint of six items might appeal to voters. Among those points was a focus on the Opioid and Mental Health issues, uniting to serve the needs of all citizens, empowering the city through education and self-improvement, being people focused, and supporting strong and safe neighborhoods. “Think big, get things done the right way,” he said. The Inskip native talked about his childhood and the lessons and values his mother and father taught him, noting the presence of his father, two sisters, brother and many nieces and nephews in the room. “We need to put our differences aside and come together,” he said, adding that he would partner with the school board, Greater Schools Partnership, and others to empower children. He added, “We can’t just leave it to Knox County and hope for the best” in educating city school children. Mannis said many county residents wished they could vote for him but are not city residents so he urged those people to find five people in the city to vote for him. “I’ll make you a promise, every day I get up I’ll go to work with a passion and vision that our kids will return to Knoxville after college,” he said. Mannis faces a growing number of opponents in the race to become Knoxville’s mayor. The non-partisan election already has opponents who have named a treasurer and those potential candidates include Marshall Stair, Indya Kincannon, Mike Chase, John Bevil, W. Fletcher Burkhardt and Rev. T. Allen Clough. Thursday, May 16 is the official qualifying deadline with the general election set for August 27.